So HBO first pulled off the stunt of splitting a decent last season into two seasons, albeit very short ones, but hey, whatever. I figured it was a cash grab to keep viewers around a lot longer than they had to hang out for. Game of Thrones books, games, stuff and videos. During an interview, Sophie Turner has pretty much come out and said that the show will not be returning until 2019. Q: How will Sansa fare next season without Littlefinger in her ear? Q: Are you excited for next year, with “X-Men: Dark Phoenix” and season eight of “Game of Thrones” set to premiere? "Yeah, I’m really excited. “Game of Thrones” comes out in 2019. “Dark Phoenix” is in November. Then I have a couple indie movies coming out. I’m a producer on my next movie [“Girl Who Fell From the Sky”]. So I’m really excited about the future." You can see the entire Sophie Turner interview over on Variety. During the interview she says that production is maybe 1/10th done with, for the final season. 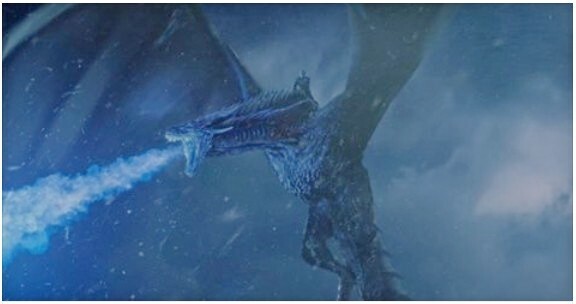 Me, I've been kind of shocked when one of the dragons was killed then resurrected as an evil ice dragon. Ug, worst part of the whole show for me. But now HBO is dicking around fans with these last two short seasons, kind of makes me not care about the show, and it's easier to not care because it will be such a long break between these seasons. Well, I'm sure everyone else will tune in, considering all of the closing developments and such.